150 Newton and AS4758 approved. 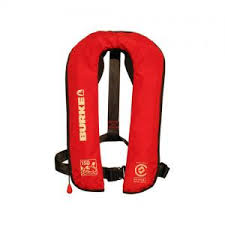 All purpose inflatable PFD suitable for a vast array of activities from rock fishing to offshore sailing. Standard nylon collar. 33 gram CO2 cylinder. Manual pull cord activation. oral inflation tube. The slimline design is comfortable enough for continuous wear and has a grab strap, extra loop for attaching a safety line, easy to adjust waistband, reflective tape and whistle.